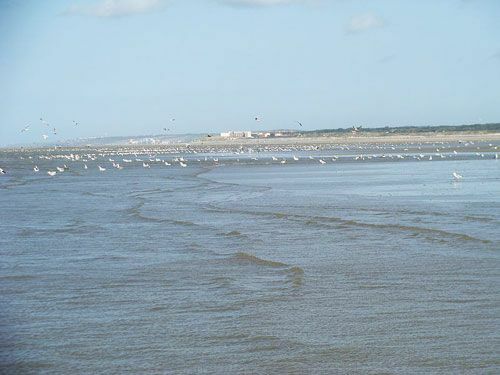 The Baie de Somme was listed as an exceptional natural site in 2000. It also ranks among the most beautiful bays in the world alongside the Bay of Halong and Bay of San Francisco. It covers 70km2 and includes the estuary of the Somme and the estuary of the Maye. The waters of the small Authie and Canche coastal rivers mingle with that of the Somme and flow into the English Channel. This vast area of freshwater becomes brackish as it meets the sea and is an ideal site for the development of fry. The banks that frame the Baie de Somme are divided into two natural environments, the mudflats or slikke and the salt marshes or schorre - prés salants - mollières. The sea submerges the mudflats or slikke twice a day. The slikke is therefore mainly composed of soft and smooth mud and is devoid of vegetation. It produces an astronomical number of bacteria that play a key role in the process of self-purification and recycling of dead organic matters. The slikke is home to a vast fauna. It inhabited by many terrestrial and marine invertebrates, bivalve species, small gastropods and fish and green crabs. It is also home to vast colonies of sedentary and migratory shorebirds such as sandpipers, knights and snipe as well as herons and seagulls. The salt marshes or prés salants or schorre are mainly located in the Marqueterre area (north bank). They are called mollières in Picard dialect. They sea submerges them only during high tides. They are populated by plant species that thrive in saline soil (Spartina, Atropis, Limonium and Artemisia vulgaris). The Baie de Somme is in fact one of the main producers of Salicornia. This plant is delicious when served with fish or seafood. The mollières come after the foreshore or estran, the stretch of coastline that is covered by the coming and going of the tides. The estran is therefore a specific biotope that consists of many natural sub-habitats. Flocks of sheep are set to graze on the estran at low tide. The saline grass gives their flesh a unique taste, which led to the creation of the label 'AOC prés-salés de la Baie de Somme'. The exceptional natural site of the Maye estuary became protected in 1968 as a national hunting reserve. This natural reserve evolved into a national nature reserve that now includes most of the Baie de Somme. It includes also the bird sanctuary of the Parc du Marqueterre. The Conservatoire du Littoral (a public institution created in 1975) bought the Parc du Marqueterre in 1986, and the Joint Association for the Development of the Picardy Coast maintains it. 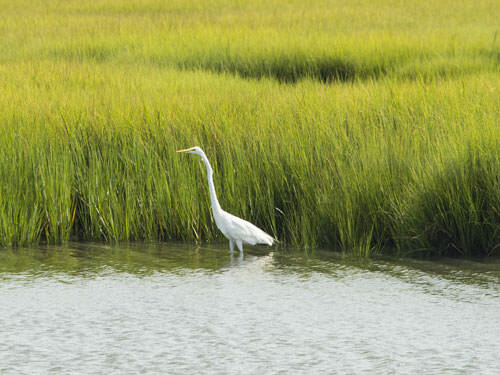 The natural reserve therefore protects the seashores, mudflats and salt marshes. However, it includes also a maritime zone of nearly 3,500 hectares. This zone stretches from the Pointe du Hourdel (south bank) to the Pointe of Saint-Quentin-en-Tourmont at the mouth of Maye (north bank). As a result, the natural reserve of the Baie de Somme was listed as a National Nature Reserve (RNN 118) in 1994. The Reserve Naturelle de la Baie de Somme is also part of the Parc Naturel Marin des Estuaires Picards et de la Mer d'Opale which was created in 2012. 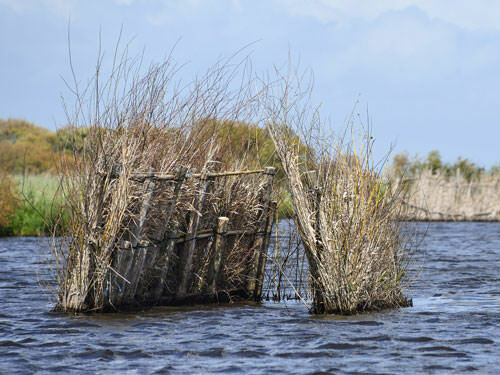 This maritime natural reserve includes the Somme, Authie, Canche and Slack estuaries. It covers a maritime zone of 2300m2. It follows 118 km of coastline from Le Tréport to Ambleteuse to the north of Boulogne-sur-mer. The purpose of this park is to learn about marine environment in order to protect it, while supporting the sustainable development of dependent maritime activities. The Baie de Somme is one of the largest wetlands in France and is part of the Natura 2000 network. In 2011 the French Ministry of Ecology, Development and Sustainable Planning granted the Baie de Somme the label Grand Site de France. This prestigious label is a guarantee of the protection of bio-diversity and environment. It also ensures the preservation of local traditions and local residents' living environment, while opening the area to tourism. The Baie de Somme enjoys an oceanic climate. Bike rides are the best way to discover it; there is a 44km long cycle track and 8 discovery tours. These will allow you to tour from Le Crotoy (north bank) to Saint-Valery-sur-Somme (south bank). You'll also find a vast network of hiking trails and even a steam train with four stations. Boat trips from Le Crotoy, Saint-Valery-sur-Somme and Le Hourdel marinas will take you to the discovery of the bay from the sea. While on the boat, take a good look at the La Pointe du Hourdel beach. It is indeed the place where you''ll see seals! The Bay of Canche (farther north on the littoral) is renown for its production of shellfish, especially hulls. Finally, historical and architectural heritage are also present in the Baie de Somme. Discover the stunning medieval towns of Saint-Valery-sur-Somme and Rue.